Recently, I read an article summarizing a Norwegian study on how practicing therapy impacts therapists' lives. I found the article extremely valuable. Many points in the article validated my therapist experience, and I'm sharing them with you today in the hopes that they will validate your experience, too. Two themes from the article reminded me of the importance of maintaining perspective as a therapist. We can get busy living our lives and doing our work, and forget that our responses and emotions are a part of a larger context. That larger context includes our professional developmental stage as well as how we transfer between professional and personal roles. "Research has also shown that the impact of being a therapist differs depending on career stage. Trainees often report positive personal effects due to gaining more self-awareness, whereas mid-career clinicians tend to focus on the stress created from their jobs. Senior therapists are more likely to focus on the ways their role as a therapist has facilitated personal growth" (Peters, 2016). This point emphasizes the changing impact and meaning of our work based on our professional developmental stage. While the participants of the research study were senior therapists, the information provided by this study can contribute to novice therapists' ideas about what it means to be a therapist, as well as their sense of ownership over their professional paths and identities. It's important for trainees to understand that they may not always have the same feelings about their work that they now have, and for mid-career professionals to know that they may, in the future, feel grateful for how their work has influenced their personal development. Senior therapists, instructors, and supervisors can use this information to help train and encourage future therapists (and each other!) on the lifespan of the therapist profession as well as its common experiences along the timeline. This can help normalize and contain therapists' challenges and emotions. Perhaps knowing this information as we enter and remain in the therapy field can lead to increased awareness about, and therefore longevity in, our field. "According to the researchers, the 'concept of work–life ‘balance’ did not offer a satisfactory way of understanding the way that therapists learn to manage their lives.' Instead, the researchers describe how clinicians 'acquired a capacity to exist in parallel realities, and that one of the ways in which they accomplished this was to co-construct, with others in their lives, a set of practices that enabled them comfortably to move across contexts, such as the shift between work and home” (Peters, 2016). What are specific strategies that therapists (as compared to other professionals) use to "co-construct" their lives with their significant others, in particular, "the shift between work and home"? What does it mean to exist in parallel realities? This implies separate trajectories that do not cross. Do all professionals exist in parallel realities? If so, how are therapists' parallel realities unique? What are the benefits or consequences of living this way? How is this an accurate or inaccurate way of describing how therapists maintain boundaries and honor separate contexts? What type of practices help therapists shift contexts? I ponder these points recognizing that most of us shift in and out of co-construction as well as awareness of the need for co-construction. Perhaps we go silent and inward for periods of time. We also may struggle in our work and life, partly because we have lost sight of how to shift within and between our contexts. Despite these challenges, many of us can answer the questions posed above based on our therapist experience, because we hold these questions daily. The therapist life requires much from us, and sometimes, we want to shut off the requirements. Other times, we welcome them. This research points to a fact that many of us therapists already know, because it is our daily truth: Our work and our lives cannot be separated. The importance of this type of research is that it presents us with information that can guide us in searching for ways to talk about our distinct profession and the way it blends with our lives and identities. It also emphasizes the importance of searching for and figuring out our specific responsibilities to our "parallel" contexts, so that we can be transparent about our experiences as therapists with ourselves, our loved ones, our colleagues, and the public. The therapist life holds unique challenges and rewards. 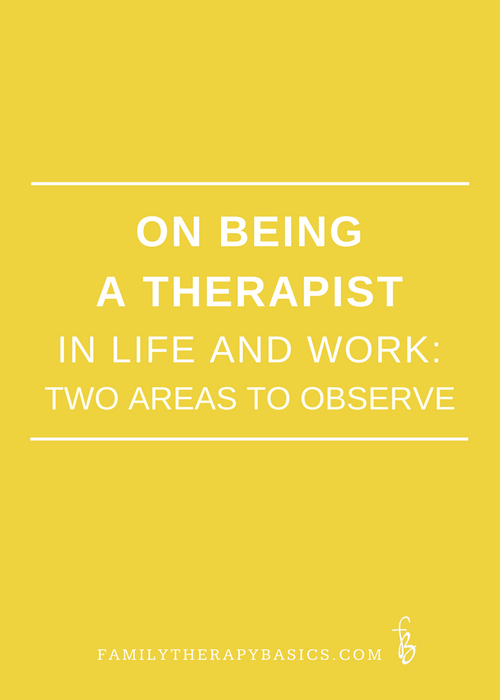 The research that inspired this post reminds us that in order to live honestly with ourselves and our significant others, we can invite our many contexts and perspectives into discussions about what it means to be a therapist personally and professionally. To find support for the therapist life, and learn how to master the Killer Bs: Burnout, Balance, and Business Branding, join us in The Refreshed Therapist Network. What is the most challenging aspect of "shifting contexts," or blending your work and life? A shorter version of this reflection was previously sent to subscribers of News + Notes.